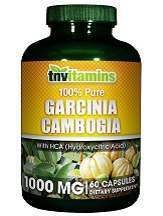 In this review we inform and advise the reader about Garcinia Cambogia presented by TNVitamins. This drug is a dietary supplement with the purpose of boosting the consumer’s weight loss rate. Its main functions are to suppress the appetite, reduce cholesterol levels and prevent new fat cells from forming. The product is available in online stores as well as in various pharmacies and shops as its purchase does not require a prescription. The formula is based on the fruit with the same name as the product. It contains Garcinia Cambogia extract without the addition of other compounds or artificial binders. This extract has been shown to impair the feeling of hunger and some tests show that it has an impact on breaking down fat deposits, as well as even preventing new fat cells from building up. The provided instructions are easy to follow and should be respected in order to avoid any kind of potential adverse reactions. The label recommends taking two capsules per day. For optimal use the consumer should take each capsules half an hour before a meal. It is advised not to exceed the recommended dosage. The price may depend on the supplier, therefore it can slightly vary from store to store. On average the listed price is $16.95 but on Amazon, for example, it is offered with a discount, costing $6.78. There are no other special offers or special package deals that may be advantageous for a customer who wishes to order several months worth of supply. We did feel that this was very cheap and this made us question the quality of this product, cheap usually equals poor quality. The manufacturer’s label does not describe any potential side effects and negative reactions. It is, however, advised to immediately discontinue use and contact a medical care specialist if you experience any negative effects. Pregnant or nursing women are also recommended to seek the advice of a physician before introducing this supplement to their diet. The manufacturing company offers no information regarding any type of guarantee, a fact which may raise suspicions regarding quality. It is unknown if a return policy exists and whether the customer can ask for financial reimbursement if standards are not met. Reviews about this product can be found on the product’s page but they also raise questions about quality. Reactions are mainly negative as most customers complain about the products quality and effectiveness. Some didn’t experience any kind of effect while others only noticed minuscule results. We reached the conclusion that Garcinia Cambogia from TNVitamins is a very easy to use weight loss supplement that is offered at a fairly low price, but it has several downsides. The manufacturer fails to mention any details about a return policy or quality guarantee. There is no information regarding the possibility of receiving a refund. The reviews we found created more suspicions regarding the quality of service and the effectiveness of the supplement as they were mainly negative with many consumers complaining about the lack of results whilst taking this supplement.